In 1967 blonde short haired #1185 Twiggy was released. She was based on a real life top teen British fashion model. 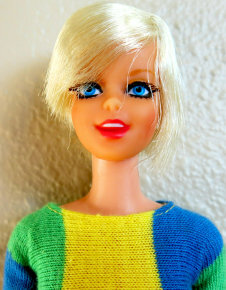 She was the first doll Mattel released that was fashioned after a real person and was only available two years; 1967 and 1968. She had blonde hair only. That same year, her look-a-like #1180 Casey arrived. She was available in blonde, brunette or red hair. Both dolls are the same size as Francie, so they can all share clothes. The way you can tell the difference between the two dolls is that Twiggy wears much heavier makeup than Casey. They both have the same head molds and they both have bendable legs, can twist at the waist and have real rooted eyelashes. Only 4 outfits were made just for Twiggy and they were released in 1968. Casey had 1 outfit which was a Sears Exclusive. The only difference between the 1967 #1180 Casey and the 1968-1970 #1180 Casey dolls is that her brunette hair in 1967 may oxidized to a reddish color. The later dolls hair did not change color. Casey's gift set had the only clothes that were made just for her. The set came with the #1180 doll as well as a green, orange and pink dress, pink coat with green trim, a floral jumpsuit and pink pumps. The hard to find #9000 Casey doll was released in 1975. 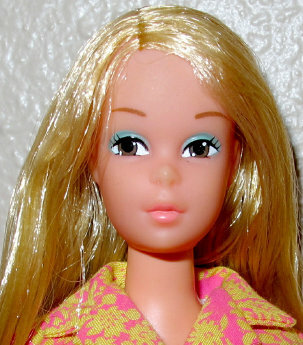 This blonde straight-leg Casey had the same head mold as the #7699 brunette straight- leg Francie. Both dolls had the same markings; ©1966/Mattel, Inc.Taiwan and both were sold as a baggie doll. Casey came with a two piece red or pink swimsuit.